← Amber Alert: Shelducks Nesting! 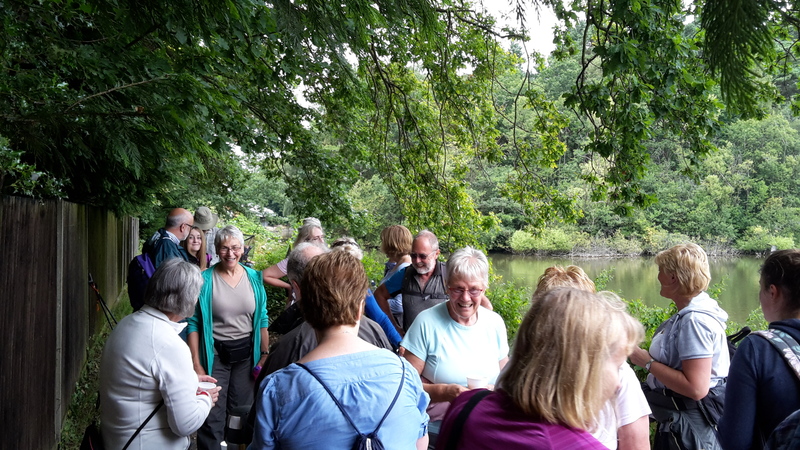 On the15th July we met at Lakeside Park for our fifth Trust walk this year. 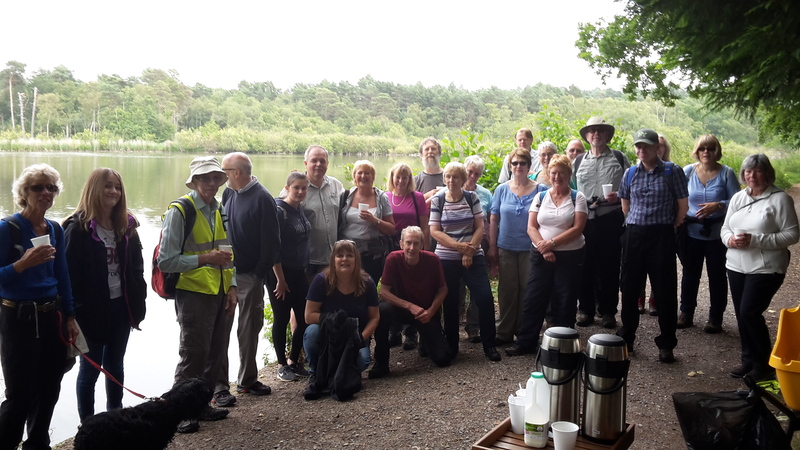 With a good turnout of about twenty five we set off into the park to pick up the Blackwater River path. It seemed that very few of the group had been here before so interest was high as we progressed north. I was pleased that in the week before, along with two of the Blackwater Valley Rangers Stu and Sam, we had strimmed and cleared the path and it was looking very neat and tidy. To avoid having to use Hollybush Lane we headed over the hill and footbridge over the A331 into the very quiet Ramilles Park. The hill was covered in wild flowers and is a reward to see after so many volunteer sessions there doing an annual hay cut to transform the old land fill site. Heading towards North Camp we discovered several green spaces hidden away. Some large poplars were of interest – especially a fallen one showing how rot had brought down a once proud specimen. We turned east and back over the road via the pedestrian bridge to enter Carrington playing fields before reaching the canal. Here, turning south we passed under the curiously named “Deadmans Foot Bridge” and stayed beside the canal until we stopped for tea and cakes beside Great Bottom Flash. Here Angus and Marilyn had used their now familiar wheelbarrow to ferry the refreshments – much appreciated by all, they have helped me enormously in organising these walks. After rejoining the towpath we continued along the now high banks until we reached the aqueduct. Here I pointed out the new steps recently created by the BV Rangers and volunteers and we dropped down the slope to see more of Lakeside Park and back to the car park having walked exactly six miles. This entry was posted in Access, Events, River, Volunteers, Wildlife and tagged BV Trust, walk. Bookmark the permalink.